I want to start this review slightly of topic. When I saw this movie at the cinemas, the projection team stuffed up. They started running the movie without sound. This continued past the main credits into the movie. Sure, once they realised their mistake, they rewound the film and started again, twenty minutes behind schedule. I wasn’t a happy filmgoer. Why is this important? The opening sequence of Mission Impossible 3 is the least predictable and most memorable part of the movie, and for me it was ruined. The film starts with Ethan Hunt (Tom Cruise) handcuffed to a chair, while Owen Davian (Philip Seymour Hoffman) holds a gun to a girls head. Davian asks Hunt where the ‘Rabbit’s Foot’ is. Hunt stalls for time and the girls gets shot. What’s going on, we ask? Who is the girl? What’s the rabbit’s foot? We don’t know. Then the film flashes back to a few days earlier – a nice little domestic scene. Hunt and his fiancé Julia Meade (Michelle Monaghan) and throwing a party. It’s a family affair. During the party Hunt is called to a convenience store by his superior Musgrave (Billy Crudup). It seems, since we last saw Ethan Hunt (in M: I 2) that he has retired as a field operative and now teaches students to be master spies. But there is a problem. One of his students Lindsey Farris (Keri Russell) has been captured in Germany. Musgrave asks Hunt if he will go into the field, one more time to retrieve his student. Initially Hunt says ‘no’ and goes back to his party, but the next day he turns up at the airport ready for active duty. Accompanying him on the mission are Luther Stickell (Ving Rhames – the only character to return from the first two movies), Declan Gormley (Jonathan Rhys Meyers), and Zhen Lei (Maggie Q). At the time of release, it was heralded in the press that M:I:3 was more substantial than it’s predecessors. This film had more heart, more soul. 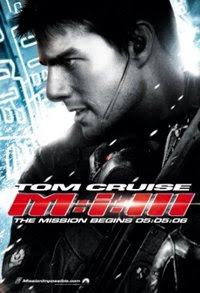 Maybe it is true that Cruise and the film-makers tried to inject some emotion into the plot, but if you look at the supplemental material on the M:I:2 DVD, you’ll see the same old tired lines in the documentaries. Paraphrasing: ‘Oh, this time we wanted the female lead to be someone, Hunt cares about’. It looks like the press releases were recycled. And in the end Michelle Monaghan’s character is not developed that much. At least not to the point, where you believe there is a strong emotional bond between Hunt and Julia. At the end of the day, M:I:3 is solid, loud entertainment that can be enjoyed by most genre fans. Just don’t buy into the palaver about this being a superior, deep and emotional spy movie and you’ll have a good time.